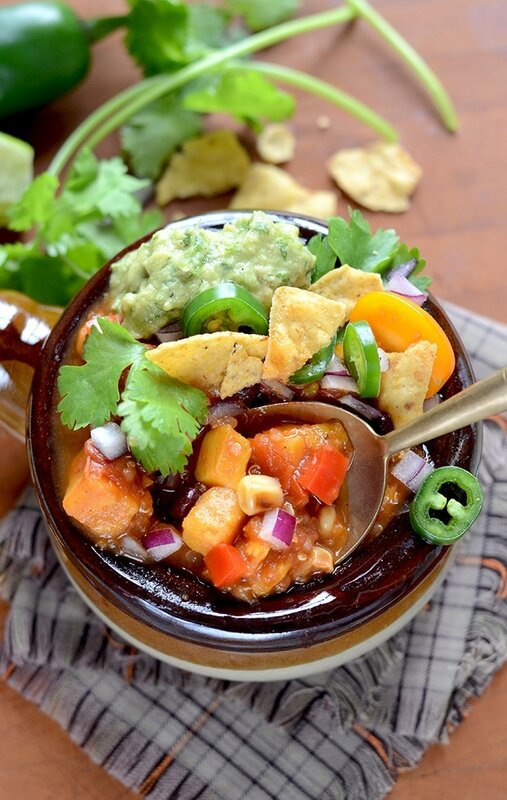 Make yourself a bowl of this Vegan Sweet Potato Chili with Black Beans and Quinoa, plop yourself on the sofa for the NFL playoffs and wonder why you haven’t done this before. Okay folks, hang on to your hats. This is Kevin here picking up some commentary for Kitty and I’m doing something that even I have a hard time believing. I’m writing about a BONKERS good vegan recipe, though I’m not sure you need to say its a good vegan recipe, its just a REALLY good recipe bar none. Now, I’m not much of a fan of most vegan food, I tend to find it less than satisfying, particularly because I’m not a fan of mushrooms, but I digress. 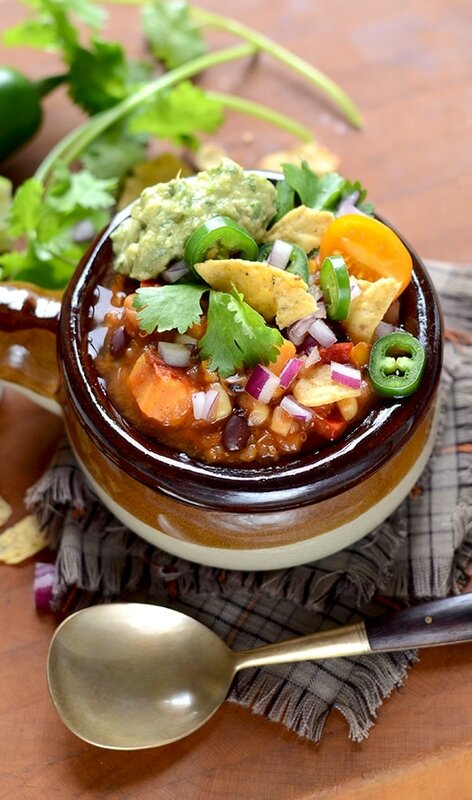 However, this vegan sweet potato chili with black beans and quinoa is crazy. Kitty had to hide enough from her testing to be able to shoot these photos…because I was going to devour it. 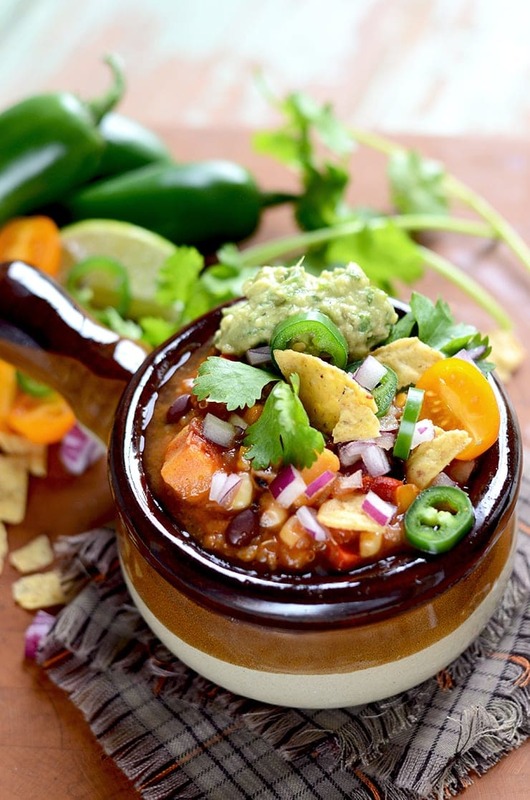 So here’s what makes this chili so delectable. The veggies (corn, sweet bell pepper and jalapenos) are roasted and added to fire roasted tomatoes. Kitty then uses Ancho chili powder to give it a real smoky richness. 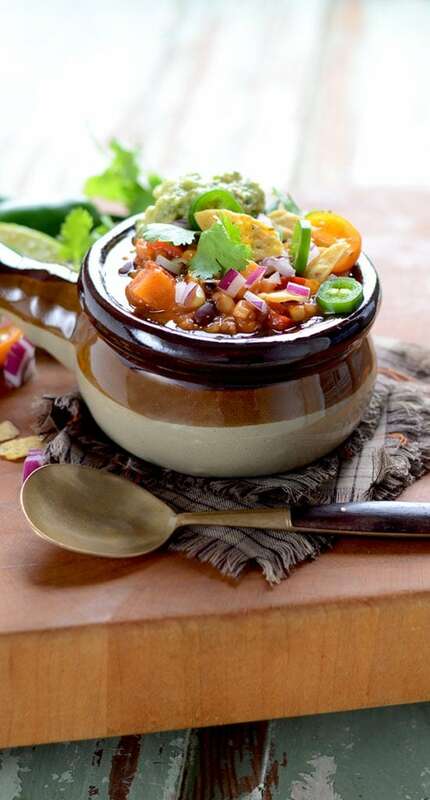 Its a chili that is hearty, filling and and nutritious. Now, as I know Kitty has said, we have a bunch of vegetarians on my side of the family and even more among our friends, so we’re always looking to find good recipes that my sister, cousins and friends can eat. Our goal with this was to find a dish that could partner with the chili that my mom makes for the meat eaters during a certain football game this February. 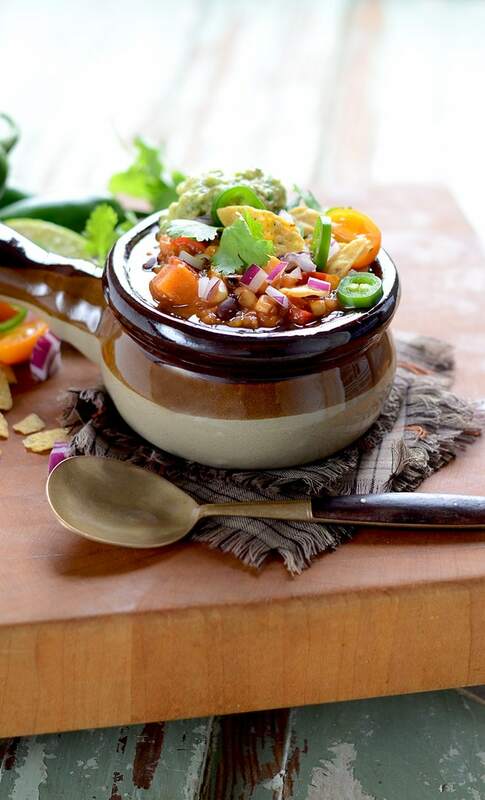 Now, this Vegan Sweet Potato Chili with Black Beans and Quinoa could stand up all on its own, but Kitty took this to another plane with her garnishing. The adding of jalapeno peppers ( I like my chili hot), tortilla chip crumbles ( I LOVE crunchy), diced red onion (because what’s chili without diced onion?) and some guacamole from scratch (though, really, just diced avocado would do the job here too) and fresh cilantro (because CILANTRO). If you had any doubt about trying this I can’t imagine why. 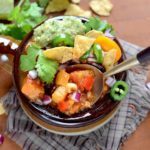 This Vegan Sweet Potato Chili with Black Beans and Quinoa is a great recipe that will have you wondering just how many servings you can get without raising the ire of your family. Just make sure you make enough Vegan Sweet Potato Chili with Black Beans and Quinoa for a crowd, because this will draw one. 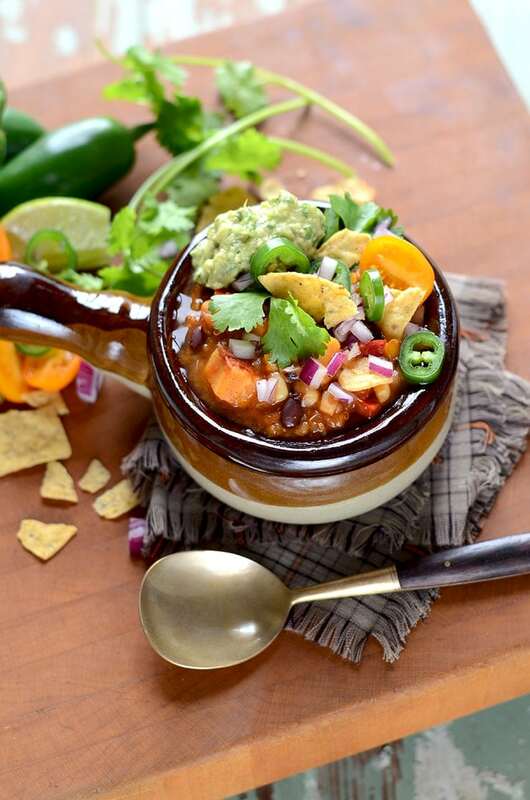 Game day is more satisfying when you have a hearty, loaded chili to eat TV side. Added benefit is that it's a vegan soup even meat eaters will love. Turn the broiler and line a cookie sheet with foil. Combine corn, jalapenos and sweet peppers on cookie sheet. Toss with olive oil and sprinkle with salt and pepper. Broil mixture 10-15 minutes, allowing veggies to char slightly. (stir mixture as needed so it doesn't burn completely). Meanwhile, in a large soup pot, heat one tablespoon of oil and saute onions until golden. Add in garlic and carrots and cook until carrots soften a little. Toss in all the spices and saute for a couple minutes. Pour in tomatoes and vegetable stock and bring to a slow boil. Add in sweet potatoes, black beans and charred veggies and simmer until sweet potatoes are soft but not falling apart. Bring to a boil, add quinoa and simmer until quinoa is cooked. 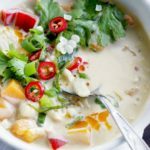 This creamy and satisfying Thai Pumpkin Corn Soup recipe combines a bounty of fresh vegetables in a coconut broth. I make healthy meals in advance to bring to lunch during the week. One of my recipes is a black bean and turkey chili. 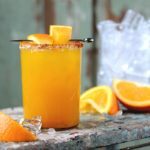 I’ve had it so much I’m kind of tired of it so I am so glad I came across this recipe! I try to get a lot of protein, so I may add a little lean turkey (I’m not vegan). Thanks! 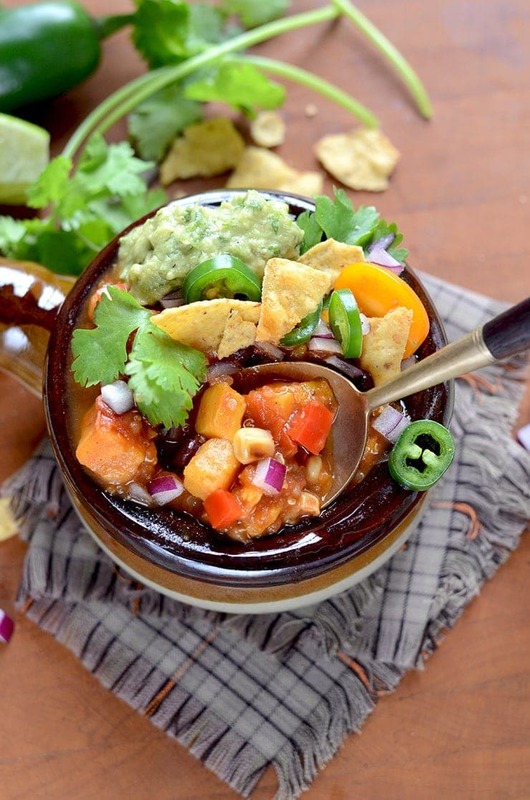 Turkey would be good but you might also like my Crockpot Pumpkin Chicken Chili. Thanks for stopping by! 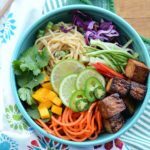 Yum, this looks like a “stick to your ribs” yet healthy dish. Perfect for winter dinner. Exactly Eileen! Plant based proteins are less caloric but still very filling.